At Monash Investors, our goal is to reliably grow investor wealth by using the equity market as a specific source of opportunity. That is, only investing in compelling stocks that offer considerable upside. One of the approaches we use to achieve this goal is to be benchmark- unaware. So what does being benchmark- unaware actually mean and why is it a smarter way to invest? To understand this we first need to appreciate what benchmark investing is, and why it is used by so many mainstream fund managers. Being benchmark aware means that when constructing an equity portfolio reference is made to the composition of the Benchmark itself and the weighting of individual stocks within the benchmark. The most commonly used benchmark in Australia is the S&P ASX 200 Index. This Index is market capitalisation weighted, which means that movements in the Index are determined by the change in the share prices of the individual stocks multiplied by their weight in the index. For example, if Stock A had a share price movement of 5% and had an index weight of 5% it would add 0.25% to the index (5% x 5% = 0.25%), however, if Stock B had a 25% share price movement and had an index weight of 0.5% it would add 0.13% to the index. By weighting the price movement of stocks according to their index weight, by definition the biggest influence on the index is the performance of the largest stocks. 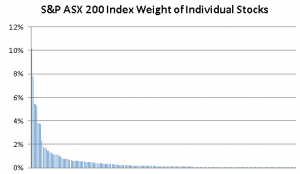 Within the S&P ASX 200, the Top 20 stocks account for around 62% of the index, the Top 50 80% and the Top 100 93%. As highlighted above, this means that movements in the S&P ASX 200 Index will be dominated by a relatively small number of stocks. 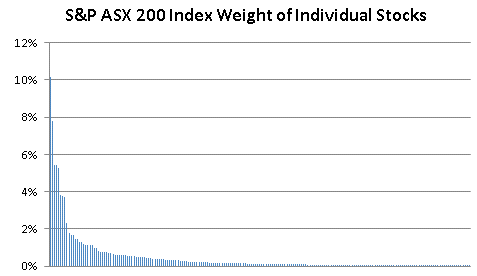 The chart below shows the individual index weights of all the stocks in the S&P ASX 200, and it can be seen that the weighting of individual stocks falls away rapidly. A benchmark-aware investor will form a view on the investment worthiness of individual stocks, however when it comes down to deciding how much of their portfolio they will invest in each stock reference is made to the stock’s individual weight in the benchmark. This means that they will hold either an under or over weight position in a stock relative to its benchmark weight. The manager will always hold the largest capitalisation stocks regardless of their investment view, as the impact of these stocks on the benchmark is so large that the risk of not holding them is too great. If you have ever wondered why the top holdings of benchmark aware managers look remarkably similar, it is due to this dynamic. 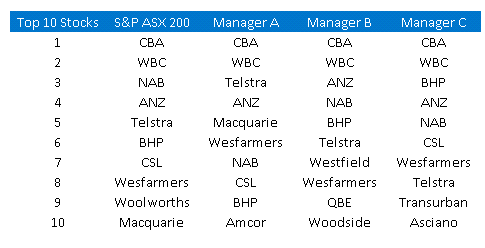 The table below shows the Top 10 positions of the S&P ASX 200 Index and those of 3 large investment managers we have named A, B and C but are all household names. 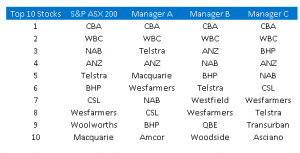 The 4 major banks are the 4 largest stocks in the S&P ASX 200, accounting for approximately 29% of the index. They are simply too large for a benchmark investor not to own. So even when an investment manager is bearish on the Banks, they will still be amongst the largest holdings in their portfolio. So why does Benchmark Investing exist? Benchmark investing exists for a number of reasons driven by both the investors and the investment managers themselves. From the investors’ perspective, typically an asset allocation decision which determines the amount of equities they will have in their portfolio is made. Then an investment manager is hired to manage the funds allocated to the equity market. When the mandate is given to the manager a series of investment constraints are usually set, which often include requirements to be fully invested, to target a certain return above the benchmark, and to maintain a tracking error in a certain range. These constraints in effect compel the investment manager to follow the benchmark. From the investment manager’s perspective, they have been given a mandate by their investors to invest in the equity market, but within the investment constraints demanded by the investor. They are personally rewarded for their performance relative to the benchmark. Therefore any material deviation from the benchmark carries significant risks to the manager. In short, benchmark investing exists to manage a specific risk, namely that the returns being generated “track” the returns of the overall equity market. It is because of benchmark investing that concepts such as relative return and relative value exist. Hopefully it is fairly obvious from the discussion above that benchmark investing is not designed to produce a superior investment result, but rather to protect against material deviations from the returns generated by the benchmark. As a small side point, why is it that the returns of the S&P ASX 200 Index are so important, given that they are dominated by the returns of a relatively small number of mega capitalisation stock? Is this really the best measurement of the investment returns that should be achieved? Following a benchmark aware approach also means that an investment manager cannot get maximum returns from their expertise. As highlighted above due to the sheer size of the Banks they will always be amongst the top holdings in a benchmark aware portfolio and therefore dominate the returns. But if a manager has a negative view, why hold them at all? In addition, a benchmark aware investor will own a number of stocks, not because they particularly like them but because they cover a tracking error risk, or offer relative value. Once again this means the manager’s full expertise is not being utilised. So what does being benchmark- unaware mean? It simply means that every investment is made on its merit, which is the expected payoff it is expected to generate. It sounds simple and the way that all professional fund managers should be running their investors’ money, but sadly this is not the case. At Monash Investors, we believe that being benchmark-unaware allows us to focus purely on producing better investment returns, by only owning compelling stocks that may offer higher returns and not owning stocks simply because of their weight in the Index. This of course means that our returns will deviate from the index, but that is exactly our goal to reliably grow investor wealth and not simply rise and fall with the performance of the equity market.